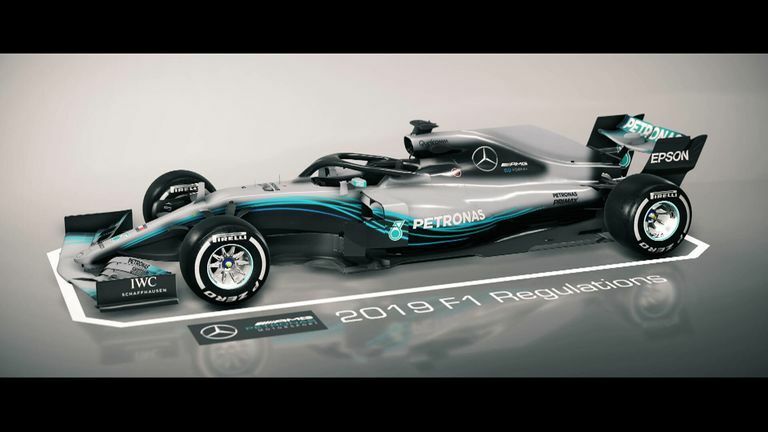 Sky Sports F1's Martin Brundle takes a look at whats to come in the 2019 F1 season. The new aerodynamic rules for the 2019 Formula season have resulted in some intriguing designs on the new cars, but will they improve overtaking and encourage closer racing as hoped? Come this way for an explainer on the changes, and insight into how much of an impact the regulations will have on racing. The FIA, the sport's governing body, are also hoping for a low 'outwash' potential - meaning less air is directed outside the wheels. If that's the case, the car behind will be able to get more grip to go through corners faster. The banning of 'blown axles', featured on the Ferrari and Red Bull cars from last year, will further smooth the airflow. The rear wings can also now be fitted with a higher flap - which could increase the strength and power of DRS by 25 per cent. The proof will be in the pudding at the season-opening Australian GP but Ross Brawn, F1's managing director since 2017 and a leading technical mind who is widely regarded as one of the sport's most influential team bosses of all-time, has already said he is expecting a "tangible" difference in the racing this year. "From predictions we're achieving about 20 per cent improvement," he explained, referencing a driver's ability to attack the car in front. While the aerodynamic tweaks have been fast-tracked somewhat, Brawn has also insisted the new rules are "not just a one-stop solution", and are "very important for the next bigger step, in 2021." Christian Horner, boss of a Red Bull team who have a knack of mastering fresh aerodynamic regulations, has frequently stated that he doesn't believe the changes will have the desired impact. "They have cherry-picked something in isolation off a future concept for 2021, and rushed it through onto the current car," he told reporters. "Just taking a front wing and saying that will make racing better, it is quite a naive and ultimately expensive approach. And of course the burden of that expense is on the teams." Toto Wolff, who has led Mercedes' trophy-laden five-year streak, went as far to say the new regulations would have the "biggest impact" on the field. "That will change everything upside down," the Silver Arrows chief said last year. "Somebody might find a loophole or a regulation or understand how these cars work earlier than others so I think there is a big, big variable in those new regulations. "We will have teams right up there that are not on the radar today." Horner, meanwhile, added: "What I think will happen in the early part of the year is that some people will have got it right, and some people won't." Teams will be hoping to follow in the footsteps of Brawn's own outfit, who entered the 2009 campaign as a new and rather unknown entity and finished it with both the drivers' and constructors' titles. Brawn, coming off the back of extremely successful tenures with Benetton and Ferrari, bought out the withdrawing Honda team at the end of 2008 to form 'Brawn GP, and immediately took advantage of the following season's aerodynamic regulations, with his team winning eight of the 17 races. "They are simplifying the cars quite a lot so we've lost quite a lot of performance initially - I believe that's the case for everybody - but we have regained a chunk of this performance," said Marcin Budkowski, technical chief of Renault, who finished fourth last year. "In terms of mixing the playing field, we feel that the top teams will have lost more than us. "But they are also better equipped to regain it quicker." The aerodynamic changes aren't guaranteed to give us better racing, but they will certainly provide added intrigue to pre-season testing and the start of the season.